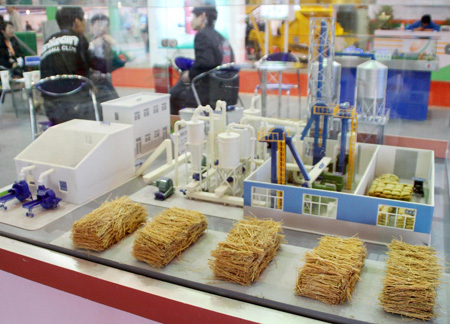 China can become a leader in the production of second-generation (2G) biofuels, made from agricultural waste instead of foodstuffs, such as sugar, starch and vegetable oils said a senior executive from one of the industries’ leading companies. That’s as the nation attempts to improve energy efficiency and reduce reliance on fossil fuels. “The United States is the biggest producer of first-generation (1G) biofuels. Regarding 2G production, no other country has shown leadership, so maybe China will move faster on this because it has been put on the political agenda,” said Michael Christiansen, president of Novozymes (China) Investment Co Ltd, referring to the nation’s 12th Five-Year Plan (2011-2015). Christiansen made the remarks in an exclusive interview with China Daily on April 15 at Boao, a small town on the east coast of Hainan province, where he was attending the annual “Forum for Asia” conference. The Denmark-based Novozymes is the largest provider of industrial enzymes and market leader in enzyme technology for biofuels. Christiansen said Novozymes has a market share of about 50 percent in China in 1G biofuel production, but more opportunities will be created as the nation’s new Five-Year Plan places a heavy focus on 2G production, although detailed plans are not yet available. Global biofuel consumption will increase from the current level of 55 million tons of oil equivalent – the amount of energy obtained by burning one standard barrel of oil – to 750 million tons in 2050. Meanwhile, over the same period, the proportion of biofuel used in the transportation-fuel market will rise from 2 percent to 26 percent, with 2G biofuels accounting for roughly 90 percent of all biofuels used, according to a report by the International Energy Agency. The nation has announced plans to reduce CO2 emissions by 40 to 45 percent by 2020. It’s expected that energy consumption of non-fossil fuels could account for more than 11 percent of the country’s total energy consumption by 2015. Currently, Chinese annual biofuel production stands at 2 million tons, he estimated. In addition, 2G biofuel production could benefit the economy with less effect on food supply and prices. Food security concerns have led the government to restrict grain-based ethanol production and to promote non-grain-based fuel ethanol production instead, according to a report by the World Economic Forum (WEF) in June 2010. In May 2010, Novozymes, China National Cereals, Oils and Foodstuffs Corporation, and China Petrochemical Corporation announced the construction of a 10,000 ton-capacity demonstration plant for commercial-scale production of advanced biofuels from corn stover – the leaves and stalks of maize plants – which will begin this year. “By the end of 2011, we plan to take the next step moving from a pilot scale, which is 20 times bigger than what we have today. Then by 2013, we will move to a commercial size, which will be somewhere between 50,000 and 100,000 tons,” said Christiansen. In common with other companies in the industry, Novozymes is also eyeing China’s biochemical market, he said. In April 2010, Novozymes and Dacheng Group, a leading corn processer located in Jilin province, made an agreement to make plastics from agricultural waste. The companies have agreed to expand their cooperation in developing biochemicals derived from biomass and to promote production of plant-based glycol. Now the two are evaluating different production methods. Christiansen predicted the company will maintain an annual growth rate of around 20 percent in the biofuel and biochemical business in China over the next five years. According to the WEF report, the conversion of biomass into fuel, energy and chemicals has the potential to generate upwards of $230 billion for the global economy by 2020. China’s use of biofuel ethanol will reach 12.7 billion liters by 2020, while automotive ethanol gasoline usage will be 100 percent, and annual consumption of biodiesel will reach 2.3 billion liters, according to the targets set by the National Development and Reform Commission. I am really pleased to see debate on different types of biofuels and the distinction being made between 1G and 2G. Blanketing all biofuels together just leads to confusion and bad judgements. I’ve been blogging about biofuels in Brazil (link below), but it’s good that the debate isn’t just focussed on the Americas.